We got up at 7:30 and ate breakfast in the apartment. Before we started out my wife broke a second tooth. 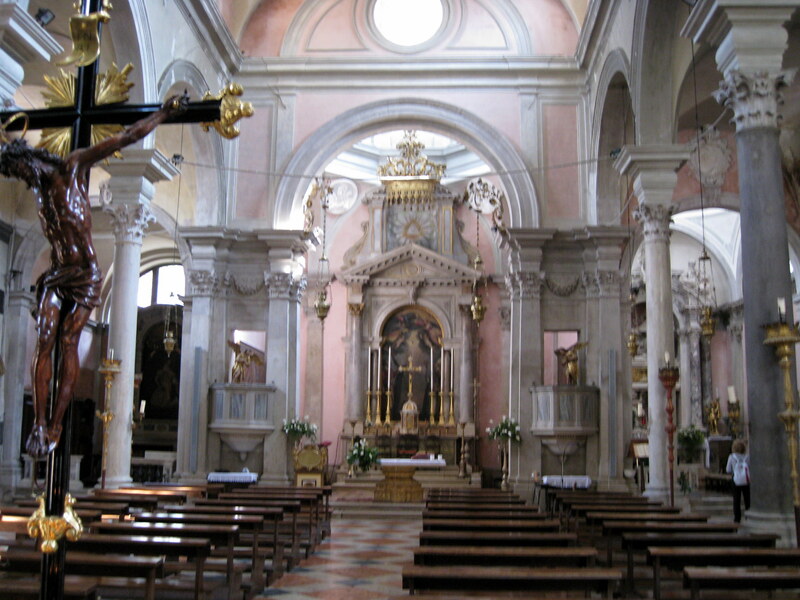 We had an agenda to see a number of churches in Castello area. 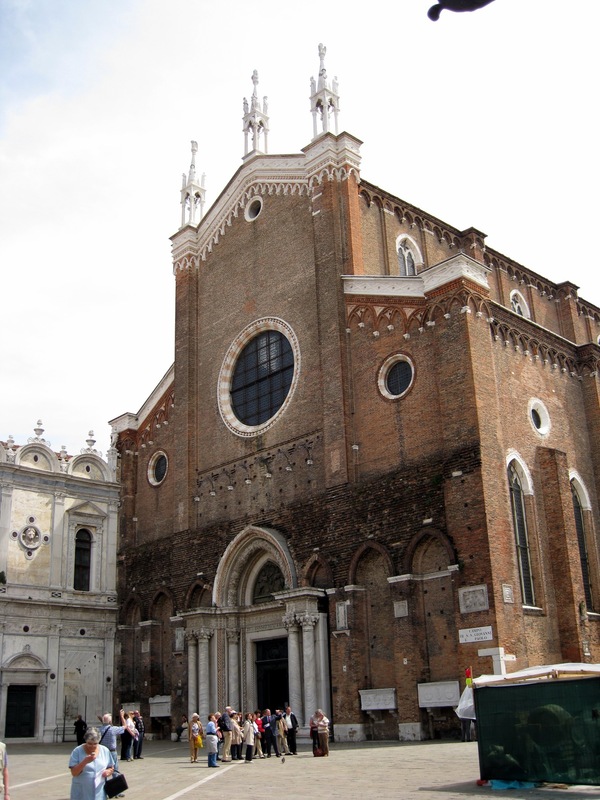 Many of the churches in Venice were part of a guild, and we purchased a ticket that got us these churches. 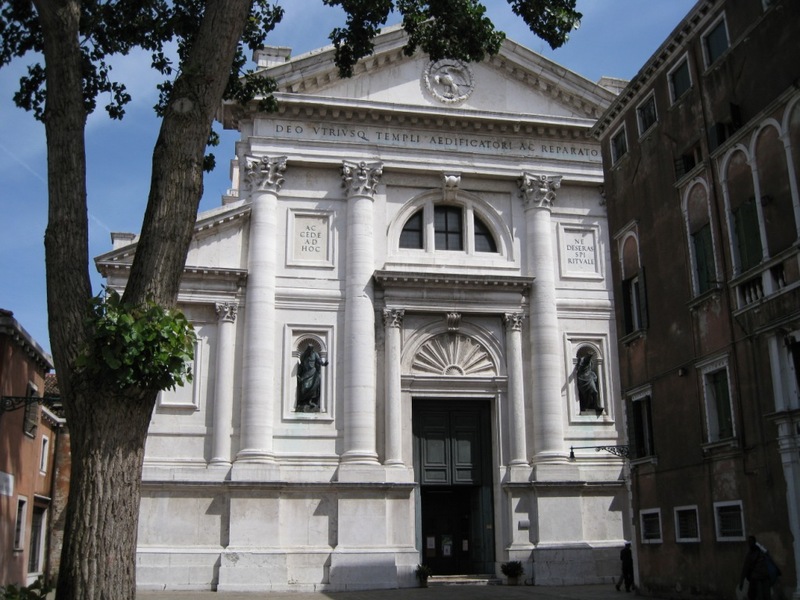 In preparation for this trip, we made a list of all the churches we wanted to see in Venice – 24 of them (and we saw them all!!). 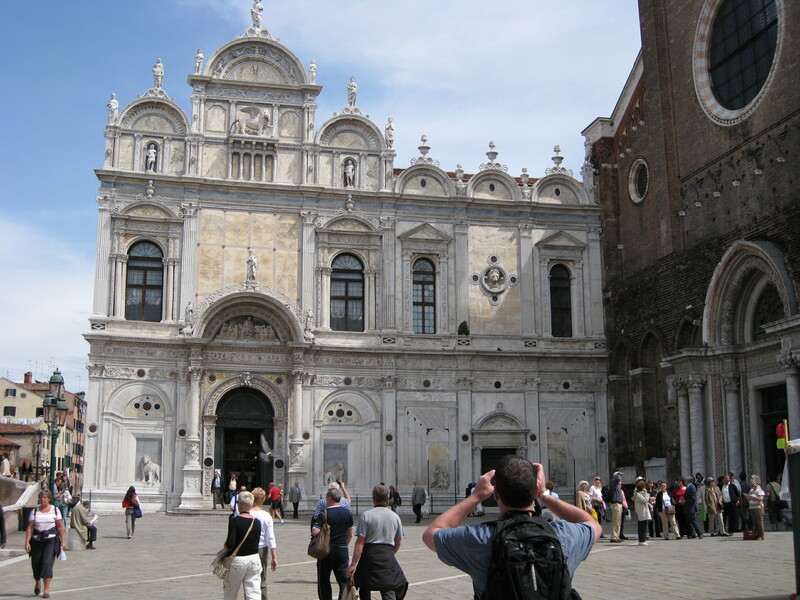 Venice is divided in several areas so we planned our church quests around a different area each day. The map above will show our route each day. Our route is traced in blue ink. The "*" is the location of our apartment. I have given letters of the alphabet to the location of these churches. 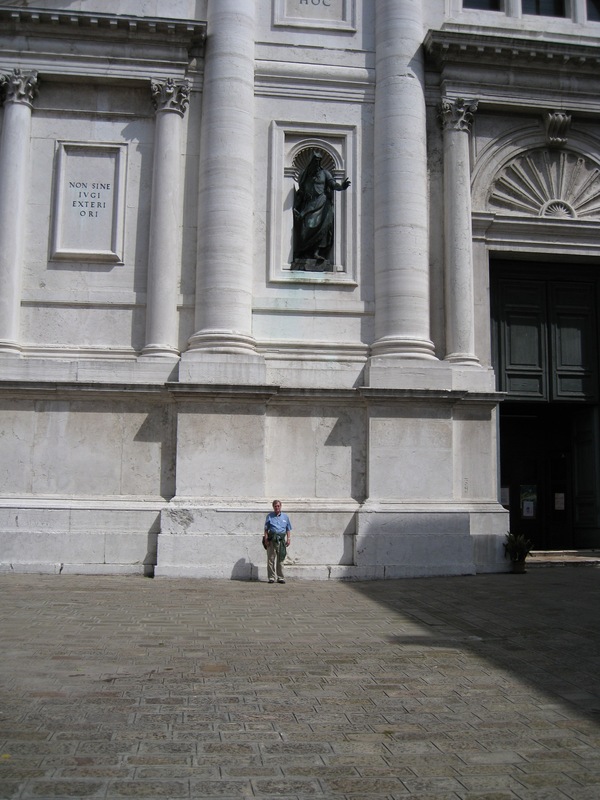 Please click on the letter in the text which will link you to a large map of Venice with all the churches marked. As with all of the churches we visited on this conquest, we studied them in detail while planning the trip. We noted various details we wish to see in each church and traveled with this list. Due to the sw download time on some it systems, I decided to include a few of photos of each church. We walked down Strada Nova towards St. Marks. The first church that we passed was the Church of the Twelve Apostles (“t” on the map). It was founded in 1000, rebuilt in 1105 after a fire and again in 1549. The bell tower was topped by a baroque onion. The inside was one large room. There was a central altar/sanctuary flanked by two side chapels. 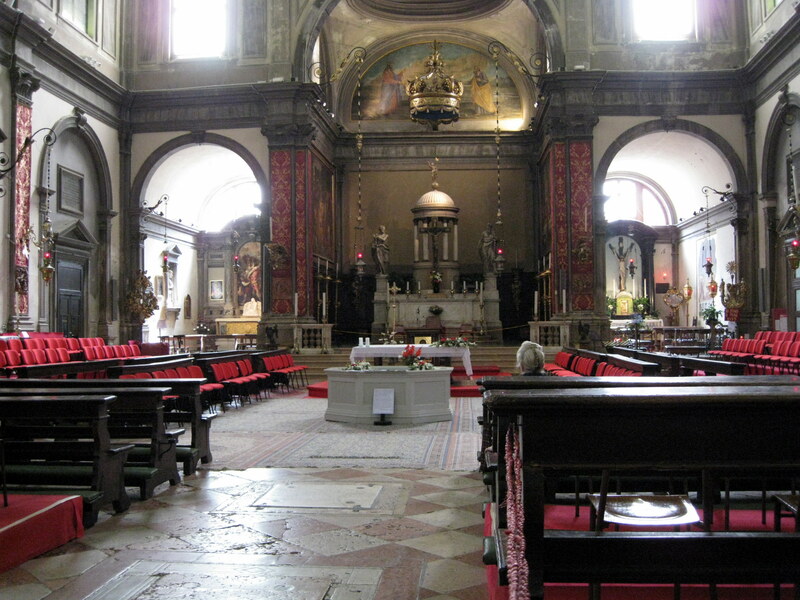 There was an altar in the center of the nave with chairs and benches on three sides. The backs and seats were cover with red material. Even though there was not a lot of “fru-fru” it was baroque. We went down a wrong street and saw a house that Marco Polo had lived in. We turned around and found the right street. We passed La Chiesa di San Canciano (“v” on the map) which was not on our list. It was built in 1351 in a Greek Cross design. It was rather baroque inside. The walls were pink and white trim. It was a rather open and airy structure. On our way to Santa Maria die Miracoli we stopped for coffee in a little shop across the bridge from the church. Santa Maria die Miracoli (“h” on the map) was built in 1481-9 by Lombardo, and is considered a M asterpiece of Renaissance architecture. The façade had shades of marble with bas reliefs and a lot of sculpture. The barrel-vaulted ceiling contained 50 portraits. You weren’t allowed to take pictures in this church, but I stood off in a corner where the person at the ticket booth couldn’t see me and took a couple without flash. It was very beautiful inside…very light. This church is popular a site for weddings. Following our trusty map and the instructions that I had written we came up Campo SS. 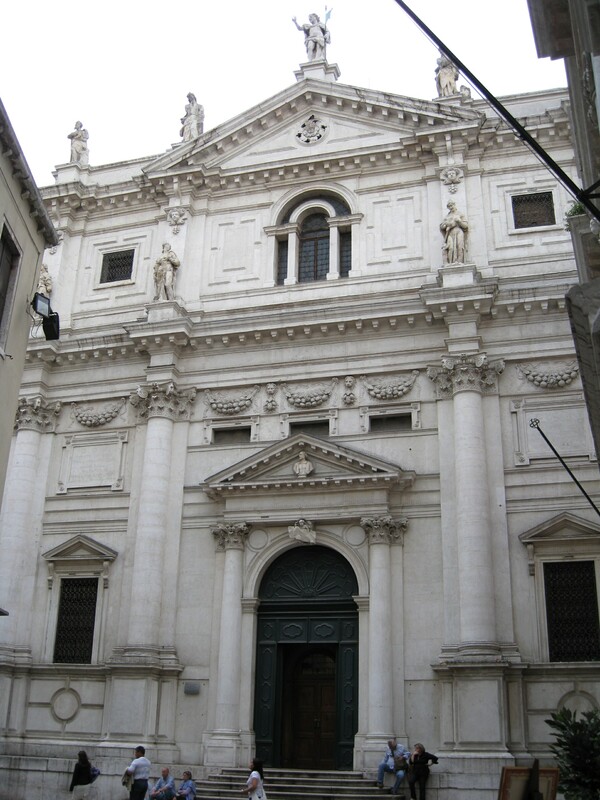 Giovanni e Paolo and the Church of Zanepolo” (Giovanni E Paolo) –Saints John and Paul “ (“d” on the map). It was b egun by the Dominicans in 1246 and finished in 1430. It is known as the Pantheon of Venice. 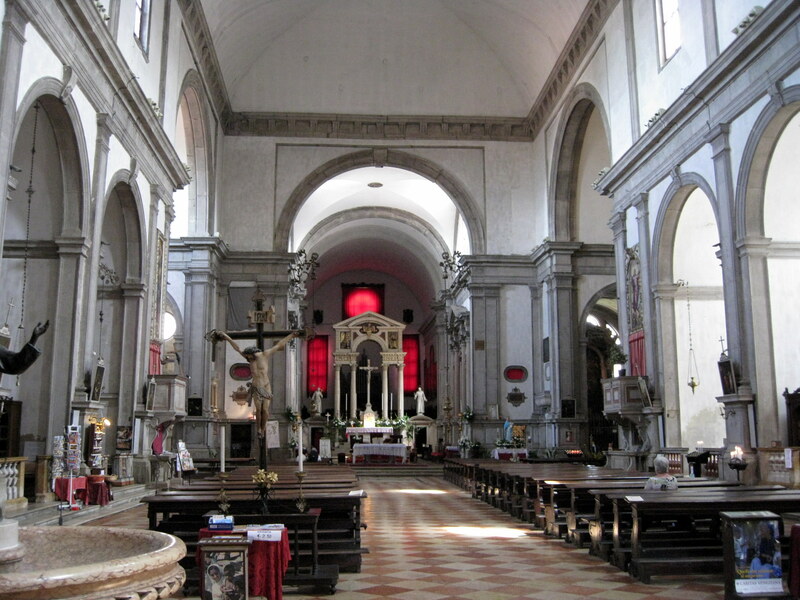 It is very large and has many chapels and monuments to 25 Doges, several of them on horseback. One chapel had the foot of Catherine of Siena in a reliquary. 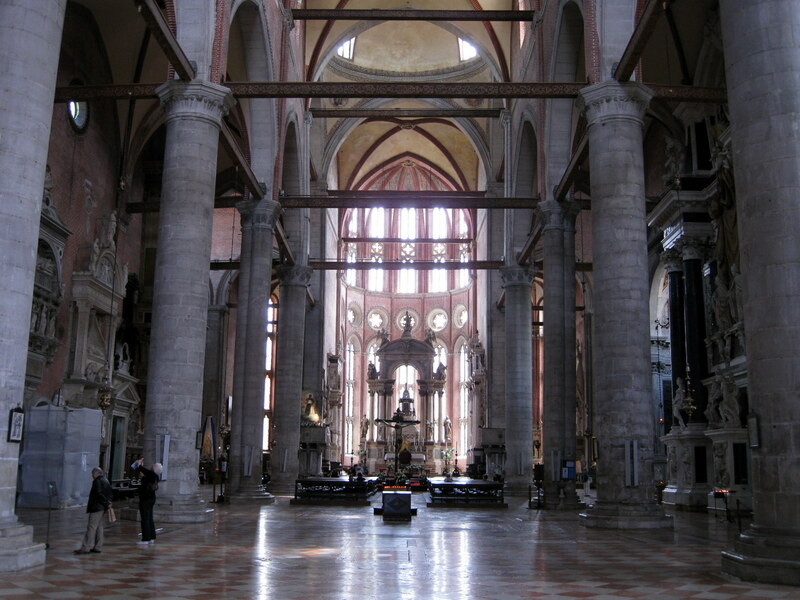 The interior is a Latin Cross with ten huge pillars. After spending a lot of time in the church we ate at an outdoor café next to the church. I had a chicken sandwich and my wife had a boiled egg sliced on bread as she was concerned about her tooth. Adjoining the church at a right angle was the hospital. It had a baroque façade. We decided to go to the hospital to see it they had a dentist. The entrance was a very large hall with several desks on one side. We asked the person if there was a dentist….my wife pointing to her tooth. They sent it through some doors where we found a couple of medics who directed us to the dental clinic. There was no one there but soon a man came out, and we explained our problem. He told us to sit down and before long a dentist came out and took my wife in his office. He was a very nice young man. He was able to put a temporary cap over the rough spot. He didn’t charge us anything. She felt much better with her tooth fixed. She just hoped that she had no more tooth problems. Feeling much better about this tooth we continued our journey. The next stop was San Francesco della Vigna (from a vineya rd that was bequeathed to the Franciscans in 1253) (“I” on the map). 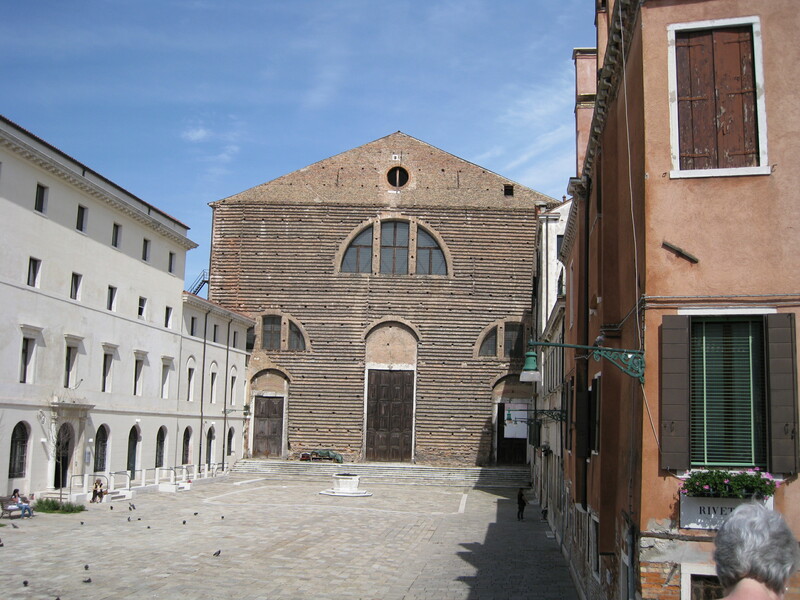 It was rebuilt by Sansovino in 1534 and Palladio designed the façade in 1562. The photo on the right gives a perspective as to the height of the lower portion of the column base. I am standing against the base. 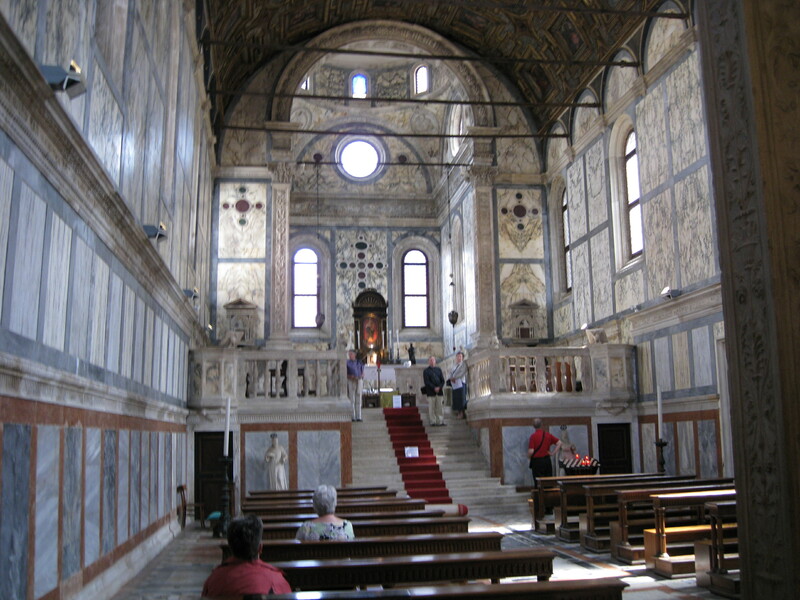 The interior contained a number of side chapels and paintings by Vittoria and Veronese. Pictures were allowed so I took plenty. Palladio was one t he most influential architects for the rebirth of the classical tradition during the Italian Renaissance. 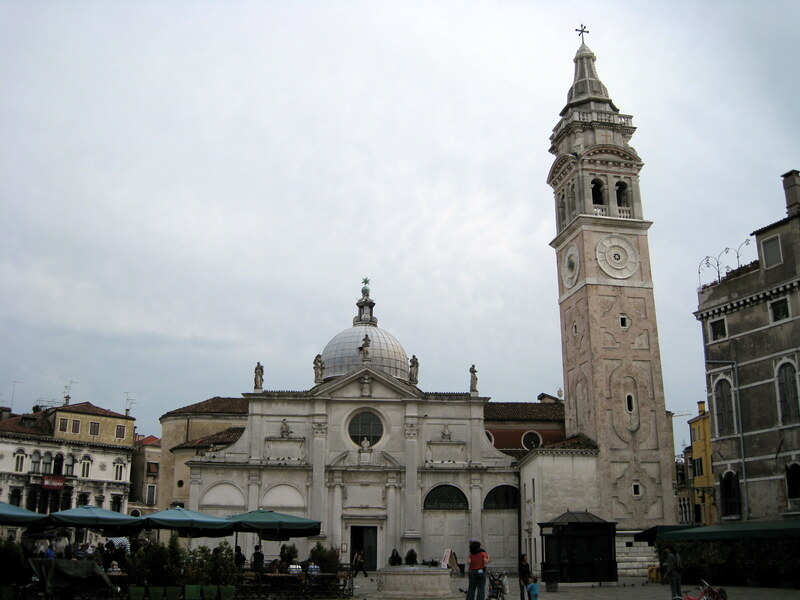 Following the Roman architect Vitruvious, Palladio made the classic style his own and promoted it in his famous book, The Four Books of Architecture, and in his buildings, mostly located about 40 miles west of Venice in Vicenza. One of his most noted is the Rotuna (see my model). Palladio was the first to adopt a columned and pedimented portico for a country house. 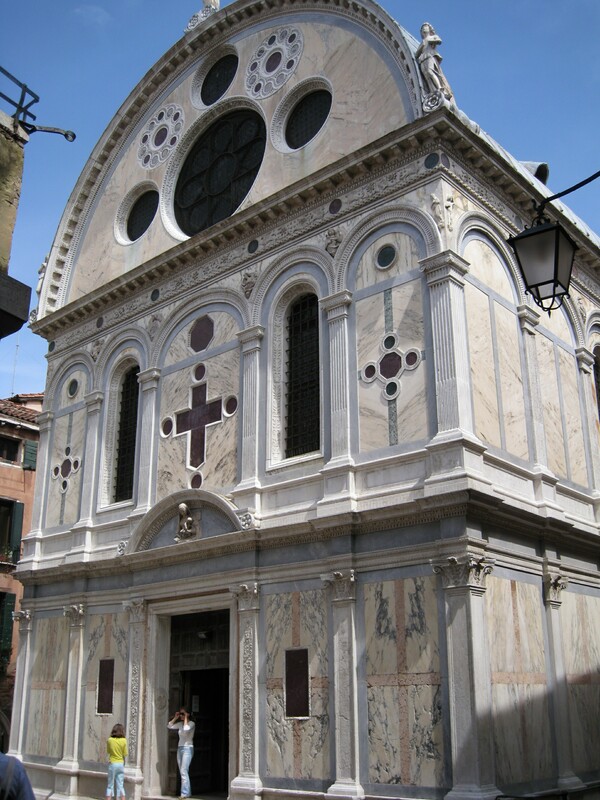 Three church in Venice were designed by Palladio - the facade of San Francesco della Vigna (above), San Georgio Maggiore and Il Redentore. 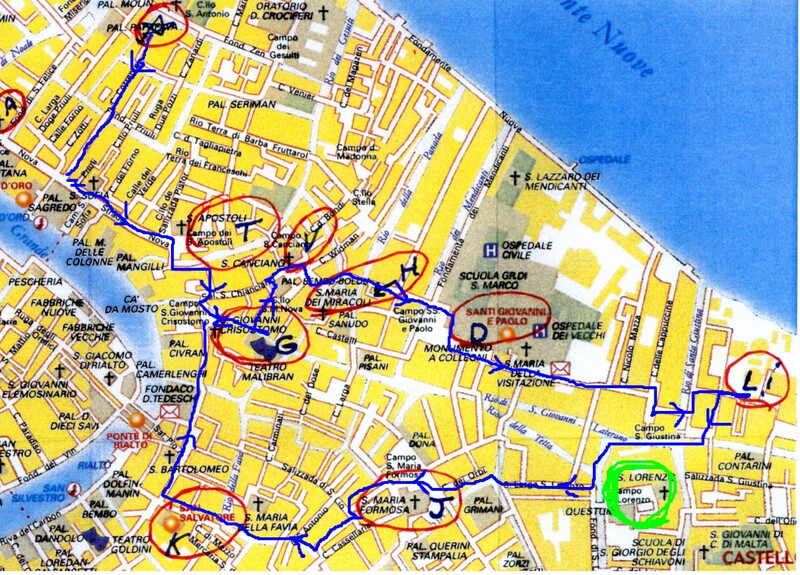 We were near the Questura, ( note the green circle on the map above) which is the police department and office of the fictional character, Inspector Brunetti in Donna Leon’s mysteries. So we took pictures along with pictures of St. Lorenzo, the church that Brunetti looks at from his office. 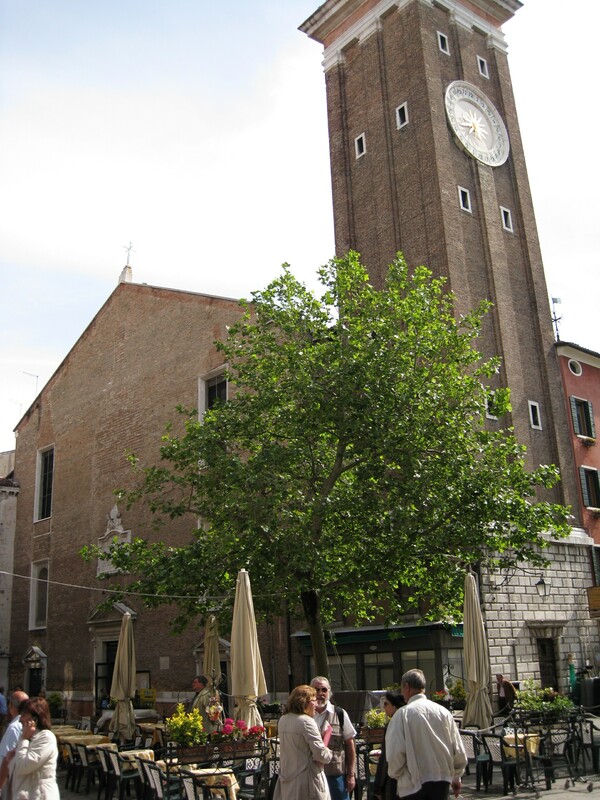 The next stop on our search was Santa Maria Formosa (“j” on the map), which dat es to the 7th century. It seems that the Virgin appeared to people in a vision as a plump (Formosa) matron and thus the name. In 1492 it was rebuilt with a double façade, one facing the square and the other side facing the canal. 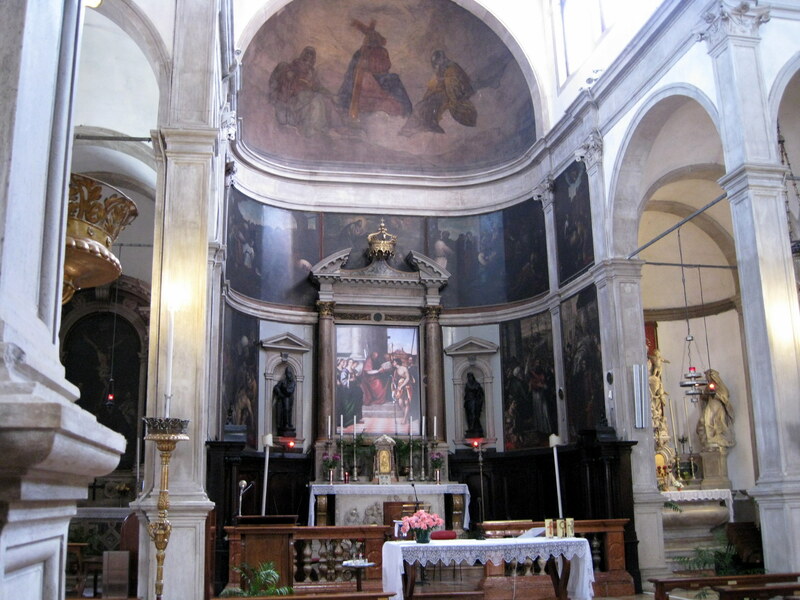 The interior was a Greek plan with three apse chapels. 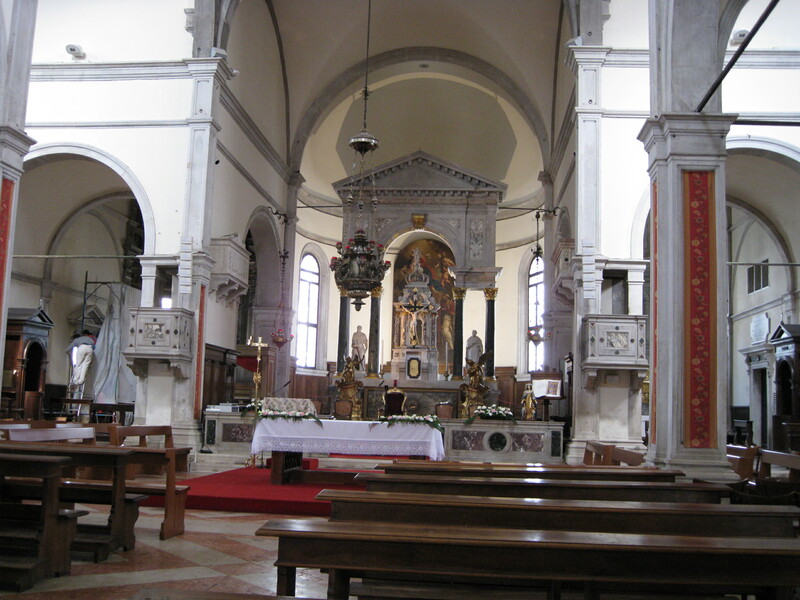 There was a main altar in the center apse and an altar at the cross in a red carpeted platform. The columns were outlined in white trim with a red interior. We could visit paintings behind the altar. This church was badly damaged during WWII. There was a nice Campo (square) in front of the church. We stopped at an outdoor café and had a drink. We were winding back towards the canal. Another stop at San Salvador (“k” on the map), which was built in the 16th century in a traditional Byzantine plan with three domes. The façade was finished in 1663. 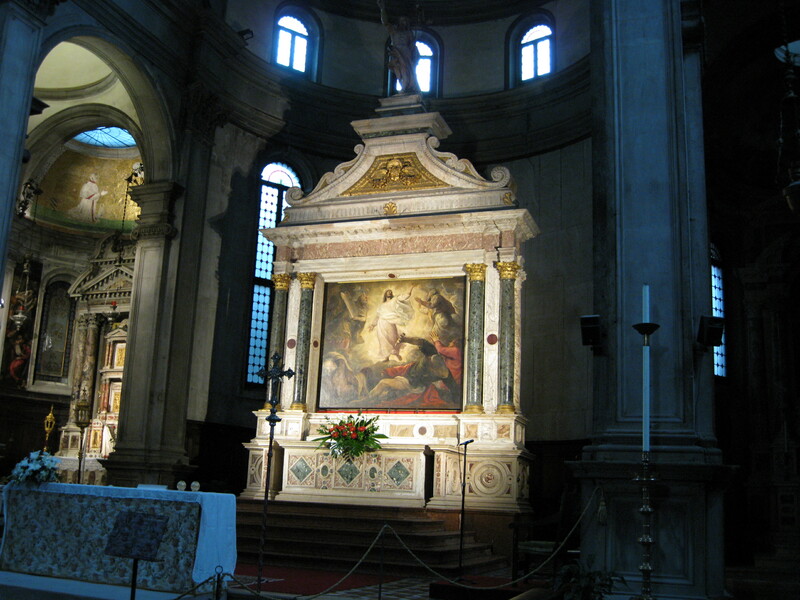 The high altar contained Titian’s Transfiguration of Christ. I took several pictures and was told to stop. 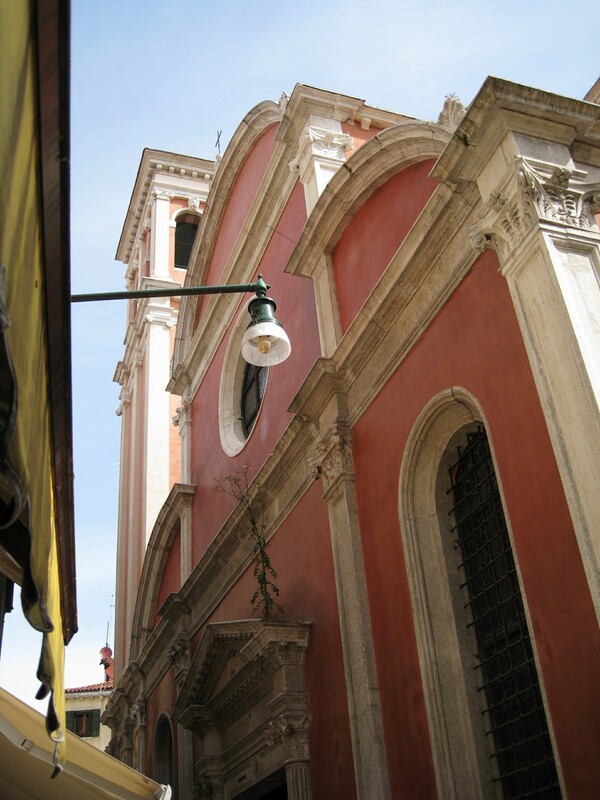 Not far from this church we came to the Rialto Bridge. We found the little café where we stopped for a drink and picture on our first trip to Venice. They weren’t set up to serve at the moment. We went in a little jewelry shop and brought my sister a bracelet and my wife a bracelet and ear rings. 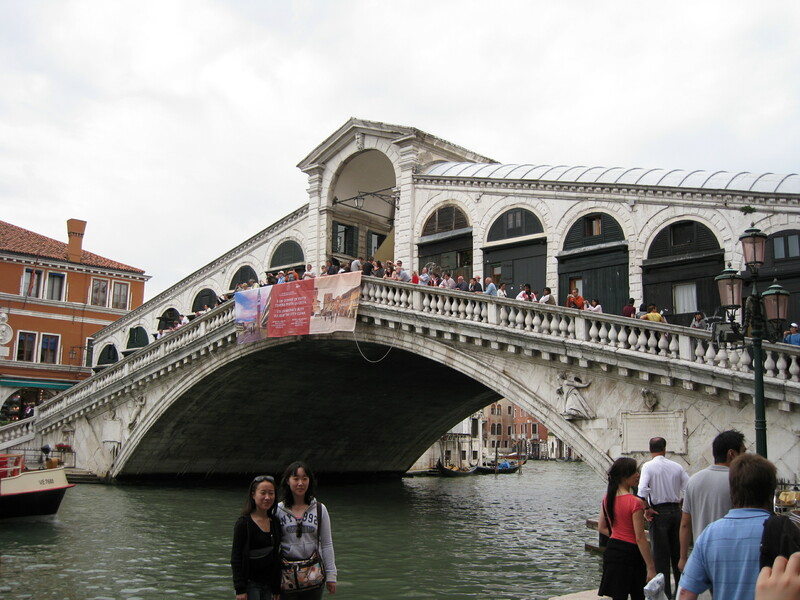 We walked back to our apartment….it wasn’t too far from the Rialto Bridge. 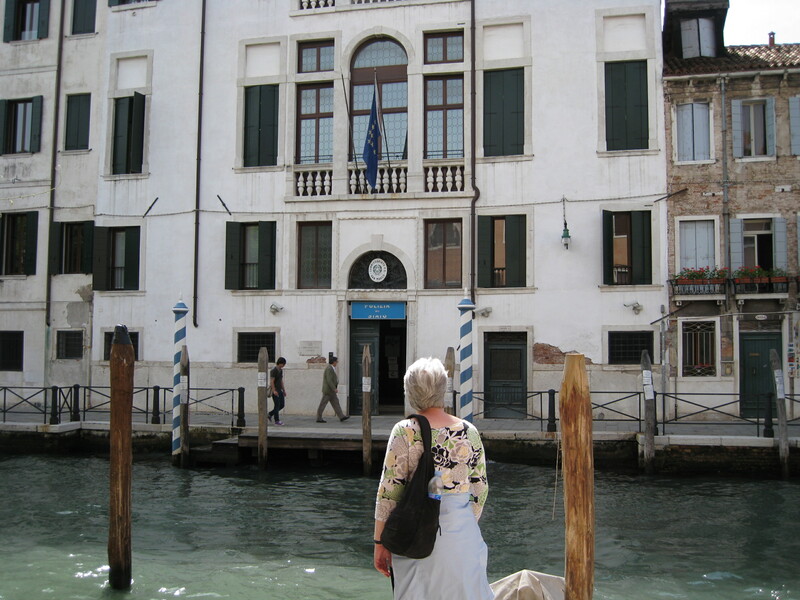 We walked back over to the Fondamente Nuove hoping to have dinner at Alvise, but it was closed. It was rainy and cold so we stopped at a wine restaurant, Algiubagio. It was very attractive and decorated as a warehouse. At the time we were the only people eating. Each table was separated by a stack of boxes. The food was excellent. I had steak in vodka, cheese and nuts, and ravioli and my wife had puff pastry, goose, cheese. We had some still and some sparkling Rose. We found our way back to our apartment and were ready for a good nights sleep.